ormer county of southwest Wales, created in 1974 and in 1996, divided between the unitary authorities of Carmarthenshire, Ceredigion, and Pembrokeshire. opography Carmarthenshire is dominated by the Vale of Tywi, but there are numerous grassy hills, mostly under 300 m/ 1,000 ft. The chief rivers are the Tywi, Taf, and Teifi On the eastern border is the Brecon Beacons National Park. In the east is the Black Mountain range, while in the north is the southern spur of the Cambrian Mountains, including Mynydd Mallaen (459 m/1,1,506 ft). Along the coast are extensive sands and marshes, and the industrial port of Llanelli is situated in the south. ommerce The valleys are fertile and the hillsides afford good pasturage. Dairy farming, stock-raising, and some woollen milling are undertaken. The Museum of the Woollen Industry is situated at DreFach-Felindre, 5 km /3 mi east of Newcastle Emlyn. amous people The home of Dylan Thomas is situated in the village of Laugharne, 6 km/3.7 mi southeast of St Clears. Bryncaerau Castle at Llanelli is now a museum housing an art gallery, a pottery collection and a display showing the history of the tinplate industry. The port was closed for trading purposes in 1951.
owns and cities The administrative centre is Aberaeron. Other main towns are Aberystwyth, Cardigan, Lampeter, Llandyssul, and Tregaron. rea 1,793 sq km/ 692 sq mi. opography Washed on the west by Cardigan Bay, Ceredigion extends from the mouth of the Dovey to the mouth of the Teifi, and has an extensive eastern boundary with Powys. The surface of the district is comprised of Cambrian and Silurian rocks, and the interior is mountainous. Traces of early British camps are scattered over the district, and there are remains of Roman roads and military stations, and inscribed stones. The ruins of the 12th-century Strata Florida Abbey to the southeast of Aberystwyth are also of interest.Part of the Cambrian Mountains are here, including Plynlimon Fawr (752 m/2,468 ft). The main rivers are the Teifi, Rheidol (with the Rheidol Falls being spanned by the Devil's Bridge), Ystwyth, Aeron, and Tywi. The Cambrian Mountain area offers a quiet unspoilt beauty which is well worth exploring. ommerce The main occupation is agriculture. In the north and northeast there are large sheep farms, while in the lower parts of the district, milk production plays the main part in farming activity. There is a large milk-collecting and processing factory at Felinfach. There are a number of small woollen mills, and a considerable amount of tourist traffic at the coastal resorts of Borth, Aberystwyth, Aberaeron, New Quay, Tresaith, Llangranog, and Aberporth. The rivers and lakes are noted for freshwater fishing, while coracle fishing still survives on the River Teifi. Formerly, mineral deposits of lead, copper, and zinc were mined here. ttractions Aberaeron - Coastal resort and administrative headquarters of Ceredigion. It has a harbour surrounded by brightly painted Georgian houses, and facilities for sailing and sea angling. There are bracing cliff-top walks with the coastal resort of New Quay just 5 miles away. Devil's Bridge - The River Mynach joins the River Rheidol where there are three bridges over a deep gorge (35 m/115 ft). The site of Devil's Bridge provides important evidence for Ice-Age evolution. Aberystwyth - Commercial, tourist, and educational centre, situated at the mouths of the Rivers Ystwyth and Rheidol in Cardigan Bay. owns and cities The administrative centre is Haverfordwest. rea 1,588 sq km/613 sq mi. opography Pembrokeshire is bounded on the south by the Bristol Channel and on the west and north by St George's Channel, into which protrudes St David's Head. The chief bays are Milford Haven and St Bride's, the coast of which is part of the national park; smaller bays include Fishguard and Newport. All have good anchorage. A number of islands lie off the coast, including Skokholm, Skomer, Caldey, Ramsey, and Grassholm, as well as many rocky islets, including the group known as the Bishops and Clerks, which has a lighthouse. The south coast is wild and precipitous, fronted by high cliffs.The area includes the Pembrokeshire Coast National Park and there is an oil refinery at Milford Haven. Group of mountains in the south of Powys, central Wales. Pen y Fan (885 m/ 2,904 ft) and Corn Du (873 m/2,864 ft) are the major peaks. It is the highest mountain mass of Old Red Sandstone in the British Isles. The area is designated as a National Park. There is a mountain centre near Defynog. ommerce Pembrokeshire is undulating, consisting of green hills alternating with fertile valleys. The main relief is the Preseli Hills in the northeast; the most important rivers are the East and West Cleddau, which unite and form a navigable portion of Milford Haven. There are many prehistoric monuments in the district. Other main industries include agriculture, fishing and woollen milling. St David's - (Welsh Tyddewi) Small town at the tip of southwest Wales, situated on the River Alun just 2 km/1.2 mi from the sea. 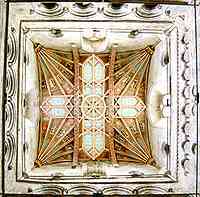 Its cathedral, founded by St David, the patron saint of Wales, was rebuilt between 1180 and 1522. Formerly the resort of pilgrims, the town is now a summer tourist centre. St David settled in the 6th century. His relics are preserved in the sandstone cathedral, which contains the stone screen of Bishop Gower (died 1347), the carved stalls of Bishop Tully (died 1481), and the fan-vaulting of Bishop Vaughan (died 1522). There are also splendid ruins of Bishop Gower's 14th-century palace. St Govan's chapel - 13th century chapel located at the bottom of 52 steps from the cliff tops south of Bosherton. The coastal path heads westwards past Hunstman's leap where apparently the hunstman's horse died of a heart attack after jumping across the gap in the cliffs. 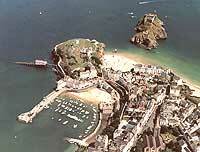 Tenby - (Welsh Dinbych-y-pysgod) Coastal resort 15 km/9 mi east of Pembroke. It is situated on a narrow promontory jutting out into Carmarthen Bay. By the late 15th century Tenby was a prosperous small port. Part of the castle and most of the 13th-century town walls still exist. Haverfordwest - (Welsh Hwlffordd) Town and administrative headquarters of Pembrokeshire, southwest Wales, on the West Cleddau River, 10 km/6 mi northeast of Milford Haven; population (1991) 13,300. It is the centre of a busy agricultural marketing area. It was a flourishing port from Tudor times to the early part of the 20th century. The castle dates from about 1120. Milford Haven - (Welsh Aberdaugleddau) Seaport on the estuary of the east and west Cleddau rivers 13 km/8 mi southwest of Haverfordwest. It has oil refineries, and a terminal for giant tankers linked by pipeline with Llandarcy, near Swansea. There is also a fishing industry and the town was used as a naval base in both world wars. The natural harbour, one of the finest in the world, runs inland for some 35 km/22 mi and varies in breadth from 1.5-3.5 km/1-2.2 mi with a depth of 29-37 m/95-121 ft. It can accommodate ships of 275,000 t. Development of Milford Haven as a major oil port began in 1957, and it has become the largest oil-importing port in the UK. The Milford Haven Conservancy Board has been set up to control navigation in the harbour and the Welsh Marine Life Rescue charity have their base in the harbour. Stackpole Quay on the Pembrokeshire coastal path, was built to serve a limestone quarry. Preseli Hills - Range of hills in the southwest rising to 536 m/ 1,759 ft (at Foel Cwmcerwyn) and crossed by a primitive trackway. A site of Neolithic settlement, the eastern section of these hills is thought to have provided the bluestone of Stonehenge; this is the only known place in Britain where bluestone is found. Coastal resort, 15 km/9 mi east of Pembroke. It is situated on a narrow promontory jutting out into Carmarthen Bay. By the late 15th century Tenby was a prosperous small port. Part of the castle and most of the 13th-century town walls still exist.